Lacking the revolutionary struggles of the constrained society in Divergent, and the badassery and depth of character development of June in Legend, I found Reboot by Amy Tintera to be lackluster in comparison. It’s already been optioned for a movie by Fox and is receiving rave reviews everywhere, but unfortunately, I couldn’t see the appeal. The concept of Rebooted humans who wake up minutes after their death stronger, faster, and with healing abilities, is appealing and unique. Those who wake up sooner after their death are more attuned to their human emotions than those who woke up later. Wren, who woke up 178 minutes after her death, is the perfect soldier. She takes on board a new student, Callum (or number 22) who is closer to human than most. He’s weak, emotional, and is going to be a problem…at least when it comes to HARC, who trains the Reboots to extract or assassinate humans. Inconsistent main character – Because Wren was rebooted so long after her death, she’s cold, emotionless, basically lacking human emotion. When she meets Callum, she is attracted to him physically, but sees him as weak as he is governed by his emotions. Instead of falling in love with Callum’s human traits, she pretty much mimics him towards the end – giggling, laughing and kissing – not the emotionless soldier we believed she was. Unappealing love interest – While Wren is the perfect soldier, Callum is weak, can’t bring himself to harm or kill humans, won’t follow orders, and is always crying in the book. I’m pretty sure he ends up being a liability for Wren. As a result, the chemistry seems forced between the two as we’re lead to believe this non-complimentary couple has feelings for each other. Weak world building – Reboot reminds me of the show Dark Angel, where humans are barcoded and trained to be perfect soldiers. However, in the book, we don’t know how or why people are rebooting and the book doesn’t go into detail about the world around these rebooted humans. Instead of fleshing it out, the plot became wholly focused on the romance. Abrupt ending with no satisfactory resolution – A huge chunk of the book focuses on Callum and Wren’s escape. There’s lots of action, but everything is a bit too easily overcome. I would have liked a build up to what happens at the end, but I was surprised when I reached the end of the book. The Aussie paperback book – I got lots of enjoyment out of the paperback book, especially with it’s rubbery feel of the cover. I also think the Aussie cover is so much better than the plain, understated US version below. The black borders printed inside the book was quite distracting at times, but I did appreciate the unique detail that went into it. The eye was kind of creepy though. For someone who reads a lot of dystopia, I can safely say that Reboot was not a stand out. Based on other reviews, it looks like I’m in the minority though. I also found it funny how people shelved this under the ‘Zombies’ category on Goodreads, due to some scenes in the book where the Rebooted people take a bite out of the humans. 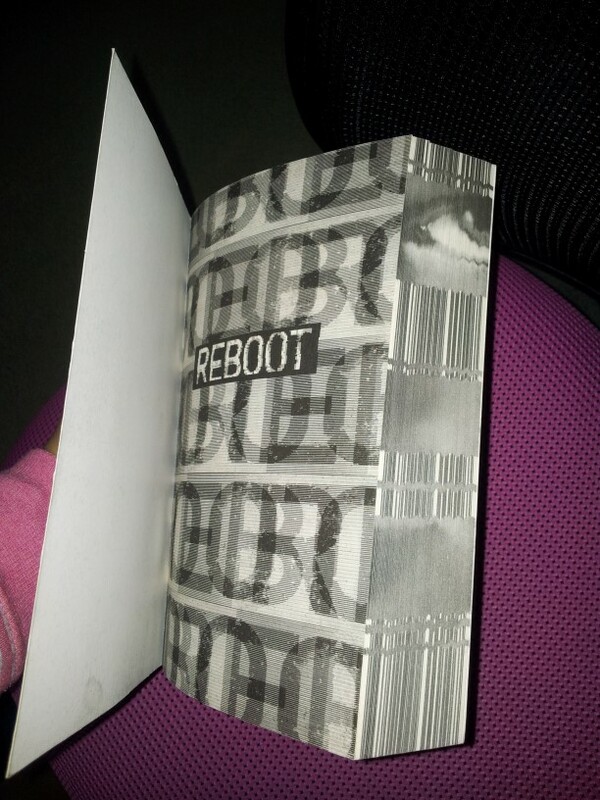 I received a copy of Reboot as a Readplus reviewer in exchange for an honest review. Yeah. Usually I'm in the minority for disliking a book everyone else loves. Oh well, such is life! Hate all these cool ideas that have such poor execution. Haha I do the same whenever I dislike a book to see what others thought, but glad you were able to relate too Leeanna. I'll look forward to your review, just frustrating when it happens hey? The bit with them running was so annoying, mainly because it was all easily resolved. The ending was definitely a sequel tease but I don't think I'd read it! Thanks Mari, glad to hear that someone finds my review useful cos I know a lot of people loved this book. Just the thing with Wren was all over the place. I liked this book more than you did but I agree that something was there that didn't make it a great book. It kinda lost my attention during the middle bit of Callum and Wren running, but the ending actually made curious enough to make me want to read the sequel. Pili recently posted…Friday Reads: Antigoddess by Kendare Blake! Hmm, interesting. Too bad about this one, although I have heard the thing about the MC quite often, she sounds frustrating and the romance doesn't seem very appealing either. Thanks for an honest review! Yeah, the main character and romance were the most annoying things here. Thanks for visiting Alise! Oh well, there's plenty of other books out there to enjoy I guess. Thanks for stopping by, Scott! That's great, just shows that these reviews are opinion and one's trash can be another's treasure lol. Callum was so real compared to Wren, but all the crying kind of grated after a while. Not sure what was going on with that ending! Sorry this one was disappointing for you! Yeah, why do authors not go into the world if they had a great idea? Maybe they took the concept to a certain point and didn't think far enough into it. Oh well. Thanks Allie! I'm reading it currently and those are my exact thoughts! I'm not buying into Wren and 22's romance at all – it feels so forced and has no spark. Only a third of the way in and nothing much has happened and I don't understand a lot of what has happened so I'm not impressed so far at all. Great review as always, hit the nail right on the head! Yay, glad to hear that you are thinking the exact same thing. I just got so frustrated because Wren and the romance was just not making sense to me. Thanks Joy, I can't wait for your review too! I don't think you're the only one who DNFed it. My friend bought it and she found it difficult to get into it. Hmmm, I did finish it though? I've learnt not to fall into "maybe the movie is better" trap, so many lost hours 🙁 I think if I don't like the book, then I won't like the movie. Oh no! I'm sad you couldn't connect to Wren or the romance. But that Aussie paperback is soooooo cool. I don't think I've ever seen a book with the pages like that! Becca @ Nawanda File recently posted…TV Pilots in Review: Marvel’s Agents of S.H.I.E.L.D. Yeah, I think other people loved it but it just wasn't for me. I know right, I was so pleased when I got it! Book lust lol. The eye is definitely creepy! Lol. "Non-complimentary couple" does not sound hopeful in the romance department. 🙁 So glad you mentioned Dark Angel, I miss that show so much! And the world building was amazing… Sigh. Cool review honey, very helpful. I'm thinking I can give this one a miss. Thanks Annie, I know I actually went back and tried to watch Dark Angel again but it wasn't as good as the first time. Thanks for visiting! I'm sorry it didn't work out for you! This is still on my TBR, but I don't think I'll read it anytime soon. You make some valid points there – all the 'negatives' you listed are things that I dislike. But the Aussie edition IS amazing. I love it! I know, not sure why the US cover is so different, I read something about different markets and different publishers commissioning the covers? Anyway, yeah there just wasn't enough to make it stand out unfortunately. Wow! The paperback looks great! It makes you want to have the book on your bookshelf. It's too bad it didn't live up to your expectations, as I think the description and the concept itself are quite interesting. Oh well… it's not enough for an author to have a good idea, I guess. Yeah, it was a great concept just wish it was fleshed out a bit more. Thanks Oana! Totally agree with everything you said! Awesome review, It just fell flat and after all the hype too! I cannot see myself picking up the sequel. 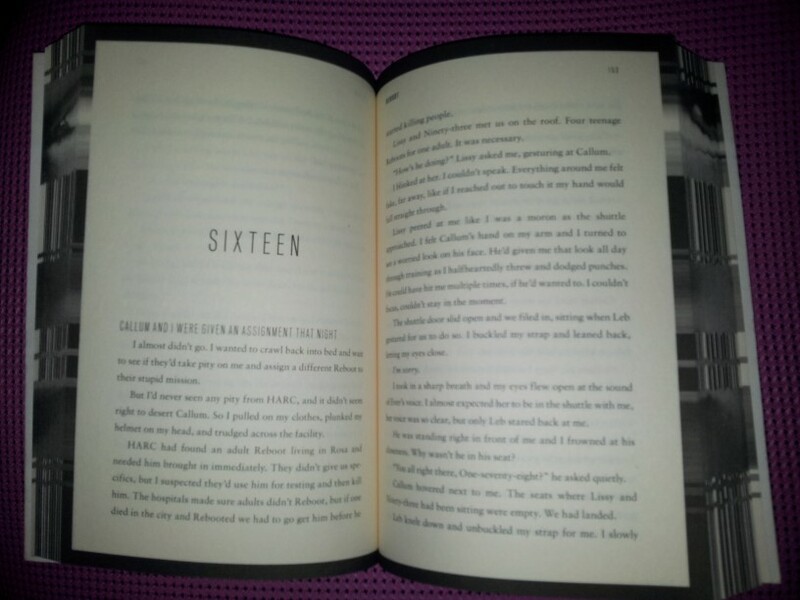 OMG that paperback tho is freaking class! I love it! Great, it wasn't just me! I checked all the reviews on Goodreads and it seems like there's quite a lot of raves out which I don't really get. Yeah, me too, I was so excited to pick it up especially with the amazing paperback. Oh well! Hmmm, I haven't heard many bad reviews for it yet but at least you can adjust your expectations now. The TBR pile is always too big to spend on books we don't enjoy. Thanks Melissa! Hehe thanks Mel! Good point, the concept and action were the best things about it, but when I got to the end of the review I couldn't be bothered lol! I enjoyed the book, but it's not a book that would stick on my mind for long time. I totally agree with Inconsistent main character. I didn't found Wren as emotionless reboot, she is more emotional than some other reboots. Yeah, and that really shouldn't be the case if we are going but what the author is telling us about people rebooting later not retaining as many human emotions….oh wells. Thanks for visiting Ikao! Ooh dude that paperback book is awesome! I heard this wasn't the best read though it sounds like it fell flat in a lot of areas. I get why she made Wren the way she is but it's very hard to connect to a character like that and that usually always makes the book meh for me. Plus the romance sounds very… not well matched >.< Hope your next read is better!! It's so dissappointing to know you didn't enjoy it! I was really looking forward to this one. I agree, I hate cold inconsistant main characters. Great review. Yeah, if she was cold and emotionless I would understand or even if there was some reference to meeting the new person slowly making her return to being humanlike. But there was none of that. Thanks Marianne! Also, from what you mentioned in your review, I'm pretty sure the romance seemed a bit forced. It just seems to me like this was just too over-hyped. I would still read it because of the concept, but I'm pretty sure it wouldn't be my favorite.